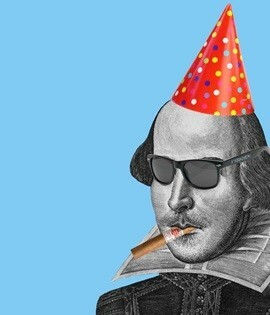 Shakespeare has been raped, pillaged, plundered, misquoted, misunderstood, edited, rewritten, bowdlerised, rubbished, parodied, lampooned and generally subjected to every indignity. He now makes his debut as a song-and-dance man but miraculously manages to retain his dignity in this irrepressible musical production. This sparkling entertainment comprises the finest comic writing inspired by Shakespeare. As well as classic songs and sketches by such well-known names as Stephen Sondheim, Cole Porter, Noel Coward, Tom Lehrer and the Beyond the Fringe team, it also features specially written material by the best modern revue writers. "And what's remarkable about the whole show is that beyond the often irreverent laughter there are frequent glimpses of Shakespeare's matchless beauty and depth of feeling." The Shakespeare Revue was first presented by the Royal Shakespeare Company at Stratford-upon-Avon. Following a sell-out run, it transferred to the West End where it won great critical acclaim. "A comic cocktail." - (Evening Standard). The show will now be presented in Auckland for the first time by a professional cast of actors and singers under the direction of experienced London trained director and actor Nick Brown.